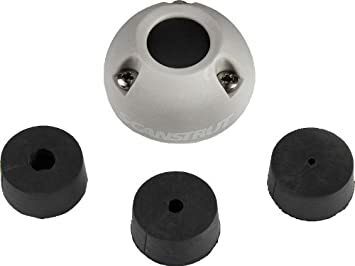 Just got a Torqeedo for my TI and am deciding if I should somehow shim to accommodate the radius of the aft deck when installing the ball mount. It looks like I could align two holes along the centerline of the boat leaving a slight gap at the outboard attachment bolts. Any experience dealing with this? Or does leaving a gap matter? Shimming is a good idea, I did that on mine with some rubber gasket material. It's not a requirement, but it does make for a better install. My battery also failed. I returned it to Torqueedo and they said it was full of water. It sits inside the hull and is exposed to the small amount of water that normally collects in there. I never thought it was enough to be an issue. They did replace it under warranty. Yes, you never want to place the battery where water can pool. The battery is resistant to water from splashing, rain, etc., but if it sits in a pool of water for a length of time, water can eventually enter via the vent hole. I've created a chart for TI motor suitability within varying weather conditions. The Torqeedo 403 vs gas outboard motor section is based upon my experience with both motor types mounted on a TI. For the trolling motor, it's based upon my past experience with such motors on boats other than the TI and projected for use with the TI. This reflects my opinion only but I believe it to be quite accurate. Others may have different opinions. The difference between the two Torqeedo ratings is that the 403/403A models use a 320 Wh battery and the 403C/403AC use a 915 Wh battery. The larger battery allows you to run the motor faster and longer for a considerably greater safety margin in bad weather. The Trolling motor battery is assumed to be a typical 12V lead/acid heavy-duty marine battery. All batteries are assumed to be near a full charge. The gasoline engine ratings assume a nearly full tank of gas (1 liter) which typically gives an hour's worth of run time. Of course, more gasoline can be carried, but I can tell you from experience that it's difficult to refill the tank in very bad weather conditions. The ratings are not only based upon available torque, but also the motor's ability to maintain adequate torque over the time and conditions it must typically operate, especially in potentially dangerous weather. The ratings assume you are running without the sail. Running with the sail would improve the ratings in good weather conditions, and possibly in bad weather conditions provided you know how to sail properly in bad weather. If not, running with the sail in bad conditions could possibly make things worse. The bad weather scenarios assume you are making a run to shore with no sail within an hour's worth of running time. If you're using the TI in areas where dangerous weather conditions can suddenly occur and you are over an hour's distance from the nearest shore, then I would consider that to be beyond the reasonable safety range of this particular boat even with a motor (although I admit to doing this myself). E: Excellent, the motor will perform without problems. G: Good, the motor will be adequate if not ideal in these conditions. F: Fair, the motor will be performing adequately but is near or at its limits. P: Poor, the motor may still help but it is beyond its limits and may not be able to overcome the current conditions. Hi...the solar panel is basically a constant current output and the inverter is expecting a constant voltage input. I would guess it might work if conditions were just perfect but would likely not work for a bunch of conditions. To add the intermediate battery gets complicated as you may also need an additional charge controller between the solar panel and the intermediate battery. This will also be very inefficient compared to finding a charge controller that goes directly between the panel and the battery. Until now i don´t use a Island. for 3 years every day from end of october to the end of march in Cuba. The Battery i under the front Hatch inside in the Boat. Inside in the Kayak the Battery is dry and no risk in the case of capsize and/or theft.